I'm trying to drill a 0.75" hole in a metal pole. I got a 0.75" drill bit from Home Depot (DEWALT 3/4 in. Black Oxide Reduced Shank Drill Bit) that I was told is appropriate for metal. I used a punch to create a pilot dent. I then tried to use the 0.75" bit but it kept on slipping. 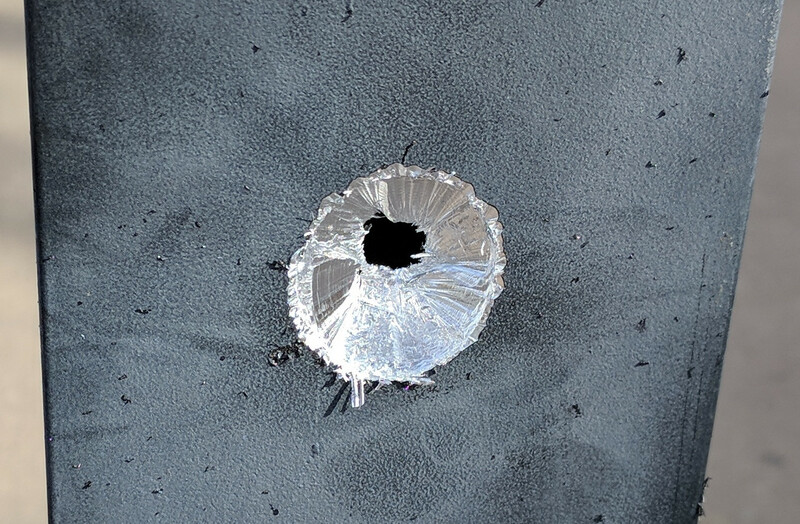 I did some research and it said that you could drill a pilot hole but that it shouldn't be more than 25% of the target size. As such I drilled a pilot hole and that seemed to help and I then made some progress with the 0.75" bit. I've now got to the point where there's a lot of vibration in the bit and the hole that it's creating is larger than 0.75" on the outside. The extra size is not a problem - just stating a fact. The problem is that after progressing through the metal I seem to be "stuck" at this point inasmuch as it's extremely difficult to get it to go further. My question: Do I just continue to apply force and push on the drill to keep going or is there a technique that will make this easier. For a hole of that size or larger a hole saw might be an easier method as it removes less material and may be more likely to stay centered due to its pilot bit. However using the more standard bit you have is working and you should be able to get all the way through. The type of vibration and unevenness of the hole from that type of bit is not uncommon in my experience, and may not really matter in the end if the exact hole size does not need to be very precise. While the bit might be dull, more likely it is harder to cut as you go deeper because initially more and more material has to be removed on each revolution, and also friction of the bit against the hole increases. You can push hard but if you seem to stress the motor of your drill (you'll hear this) back off somewhat. Also pay attention to how hot the motor / casing is getting. Warm is OK but very hot or a burning smell is obviously going too far. Be cautious as the bit starts to pass through the far side. Unique to drilling metal (as opposed to wood) the flutes of the bit may tend to "bite in" and you could get a sudden and significant wrenching action on your arm, hand, thumb, etc. Hold the drill very securely, use an extension handle if you have it, and maybe brace it with your body. For the last bit of depth I would push more lightly but spin the bit quite fast. The hole may turn out to be a little smaller than 3/4" (or whatever exact size the bit really is, such as 47/64ths). That may seem impossible but if you think about what the cross-sectional shape of a slice of the bit looks like it may make more sense (its not a circle). If the hole is rough you may need to file it down by hand before using it. Whatever goes through it is likely to get damaged. To drill through metal, use a "slow speed and heavy feed". That is, make the drill bit rotate (relatively) slowly, but push hard. Also note that drill bits are directional -- they either cut when rotating clockwise or counterclockwise. You can tell which edge is the cutting edge by gently running your finger along the drill bit's edges. Make sure your drill is rotating the drill bit in the correct direction -- so that the cutting edge is digging into the metal. Applying less pressure than optimal while drilling a hole causes worse results and more wear on the tools, not less. This is completely different from the behavior of high speed abrasive grinding tools like a dremel for which a very light touch is best. Metalworking tool bits on the other hand function like chisels - their cutting edges dig into the (less hard) material being worked cutting and tearing it away by brute force. Without sufficient pressure to drive the cutting edges of the tool bit into the material being cut the spinning action of the drill motor won't have any direct positive effect whatsoever. A fast spinning drill will accelerate tool wear from friction but also produce tremendous heat which will, in many materials, soften the workpiece and allow the drill to start cutting even though the pressure at the edge of the tool was too low to cut initially. However some materials respond to this abuse by getting harder or stronger and/or the ever increasing heat will eventually reach the point where the tool itself becomes softer than the target material - goodbye cutting edge. So even using cutting oil and rotating the drill as slowly as you can will do nothing without sufficient pressure. A bigger twist drill is like using a wider chisel, all the force exerted on it is distributed along a larger area resulting in far less pressure. How much pressure do you need? be happy that pole looks like aluminum and not steel as only 100 pounds of force or so is probably enough (and extremely hard to apply sideways to a hand drill) (calculator here). A .75" twist drill it like the one you have is just about useless for cutting steel without a drill press. The real secret to machine tools being able to carve though metal isn't speed or power - its their rigidity that can apply enough pressure at the edges of their cutting tools to carve steel like butter. The step drill is perfect for use with hand drills because it cuts with single cutting edge only as long as the step size of the drill ( as it enlarges the hole being cut one step at a time ) so the amount of force required to get the drill to cut into the material is the same for each step ( and similar to the pressure required to get a 1/16" drill to start). It is wise to slow down the rpms as the hole grows however, as the rate of metal removal does increase geometrically. Unlike a twist drill they make almost perfectly circular holes as their cross section is almost circular. I've even cut partially overlapping holes with them, which is impossible with normal drill bits. If you can cut from both sides of your target these bits are their own best deburring tool. Although they are frequently marketed as self-starting, I prefer to make a pilot hole with a sharp twist drill first. There are 2 flute versions of these bits, but for use in a hand drill the single flute versions are superior in every way. Likewise, for making countersunk holes in metal using a hand drill one flute is far better than 3, 4, or 5. Finally, since a good step bit will cost $25-$40 if you hardly every need to cut largish holes and don't need precision, go with a super cheap hole saw kit for about $10, they'll work once or twice and cost less than solid drill bits. When drilling into metal always use a cutting oil, at the minimum use an oil to reduce the friction and heat build up. I know that sounds counter intuitive reduce the friction, however you are not burning through the metal you are in effect cutting through the metal. Since the bit is to be cutting through the metal ; lubricating the bit is what allows it to maintain its sharpness through the process. For a large hole such as a 3/4 inch size hole - the pilot hole is fine but note that as your bit cuts into the metal the possibility is that the bit will grab into the metal and not actually cut but will jam. At that point you will need to back off of the pressure and then start to drill slowly with a light pressure and then speed up the bit until the bur your bit had grabbed is cut away. You may then drill as normal. NOTE: When the 3/4 inch bit finally goes through the metal it might grab much like a screw and not cut like a drill bit; simply hold the drill and keep it from moving forward while drilling at high speed. To answer your question, based on where you're at, meaning that hole we see in the picture with a drill bit vibrating as you said (which is beyond the point of starting the whole with smaller bits), in my experience (I have since learned my lesson), you should use a drill with high speed, and not make full contact with the metal, kinda keep a certain distance so you only hit the raised spots where your'e making the hole to eventually smooth that surface out and avoid the vibrations. Beware though, because this is a large bit, if you are in high speed (low speed as well), if you don't protect your arm, meaning grab on to something, what can happen is, the bit can get stuck and spin on you and you can even break an arm, so BE CAREFUL. You can also use a step drill bit. Again, this is based on where you're at. Buy a step drill bit that is meant for drilling holes in metal with conventional drills. No need for a pilot hole or any other weird ideas. It gives you complete control, no vibration, and won’t create a crater in the material like you have done. You’re going to end up with a 1.5” hole shortly. A carbide hole cutting bit as recommended would also work. Heat is the main enemy when cutting metal. The heat changes the structure of the metal that you are cutting and the tool. Oil, especially cutting oil, will remove heat from the cutting surfaces and keep your cutter from dulling. Cutting oil has extra chemicals to 'soften' the metal without damaging the tool. Get a "step drill" or a "three flute drill" if the metal-pole is not solid but has a wall thickness of roughly half the drill diameter — in your case 0.375. "Cold-drawn" material tends to be very tough and is notoriously difficult to drill by hand with a standard drill. Whatever you do, don't use carbide tipped drills, as someone suggested. Carbide drills for metal are not meant to be used with hand tools. Not the answer you're looking for? Browse other questions tagged drill metal metal-cutting bits or ask your own question. What are the key differences between a step drill bit and a knockout punch? How do I drill through a shaped tube with a handheld drill? What did I drill into? How to drill plastic without the bit “grabbing” it? SDS hammer drill torque vs impact drill?